Green tea has antioxidant properties, as it contains a high concentration of polyphenols, as explained by the University of Maryland Medical Center (UMMC). It also may boost metabolism and help burn fat. You can use green tea for weight loss by drinking the tea or taking green tea as a supplement. One study, as noted by the UMMC, has found that green tea with caffeine improved weight loss and weight maintenance in overweight individuals. Green tea contains caffeine, and drinking large amounts of caffeine can cause many side effects, according to the UMMC. This is particularly true for people not accustomed to caffeine. Possible side effects include dizziness, insomnia, anxiety, irritability, jittery feelings, restlessness and fast pulse. Large amounts of caffeine also can cause upset stomach, nausea and diarrhea. Caffeine overdose is possible, with symptoms of headache, abdominal spasms, nausea and vomiting. Caffeine overdose may call for medical attention. Because it contains caffeine, green tea is a diuretic and causes the body to lose water, as explained by physician Andrew Weil. Dehydration may occur if you don't replenish water lost through frequent urination, as cells start drawing water from the blood. 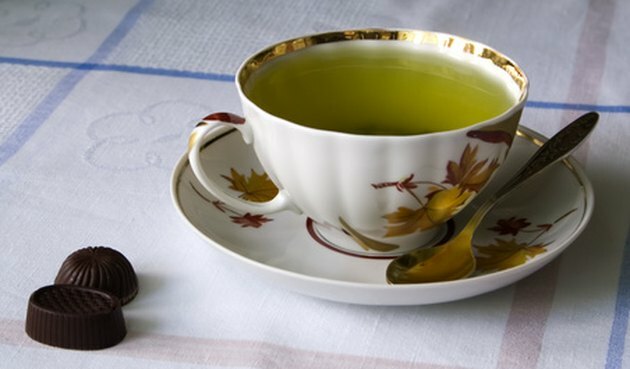 Drink plenty of non-caffeinated fluids while using green tea for weight loss. Caffeine can also lead to more serious health effects, according to Weil. It can result in heart palpitations and irregular heartbeat, and may cause or worsen high blood pressure. Caffeine also is associated with prostate problems and other urinary disorders. The substance is an irritant to the urinary tract and causes smooth muscle of the bladder and prostate to constrict, which can make urination difficult. Some people have reported liver problems while taking concentrated green tea extract, according to the U.S. National Institutes of Health (NIH). This side effect is not associated with drinking green tea beverages or infusions. These cases are very rare and not definitively linked to green tea. The NIH recommends that people take concentrated green tea extracts with food, and stop using green tea extract and seek medical attention if signs of liver problems occur, such as dark urine or jaundice. Green tea may cause a severe rise in blood pressure when taken with monoamine oxidase inhibitors (MAOIs), medications prescribed for treating depression, according to the UMMC. This side effect can be life-threatening. People taking MAOIs should not use green tea for weight loss or any other reason.